True to science, discovery of great things happens accidentally! I think it applies to cooking as well or rather recipes in my case today. I am not sure how I landed in reading about Tzatziki. Something made me persistent in reading more about it. One led to another and I ended up reading about Gyos. Wiki says a gyro is a Greek dish made with mostly grilled meat and alternatively can be made with feta or haloumi cheese as well. And usually served in a pita bread or sandwich stuffed with onions, tomatoes and Tzatziki sauce. 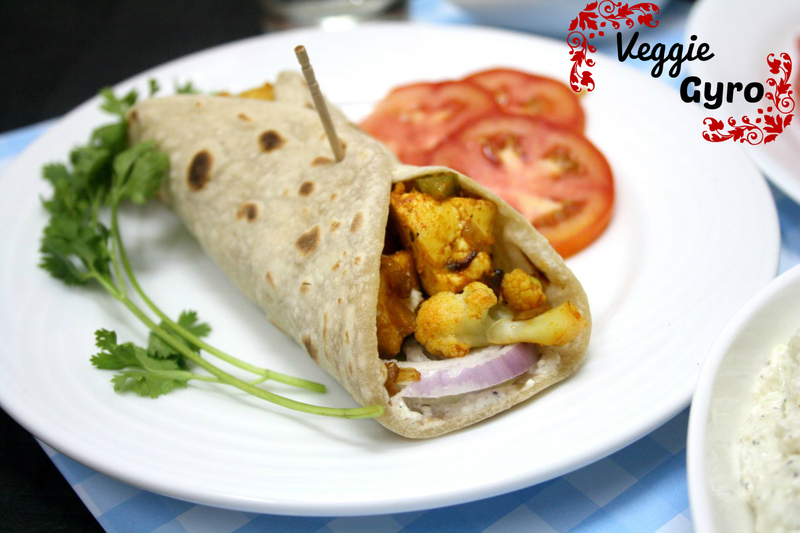 Reading that it can be served with cheese, or grilled meat, I decided I would opt for grilled vegetables or Paneer. Just to see if there are other players who have already made this and enjoyed, I searched the net and lo I am the last person on earth to discovery Vegetarian Gyro and there was one with Paneer/ Indian Cottage Cheese as well. Having a tailored dish is such a convenient task I tell you. I decided to read through both the sites and try out the best I can make for myself. 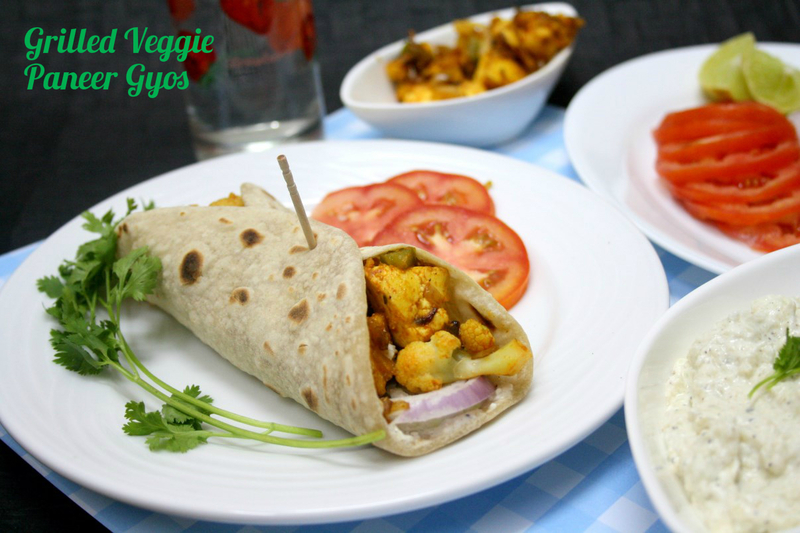 I wanted to make both grilled veggies and paneer blend. Made a Roti for the wrap and the sauce was all ready by the time I assembled it. The paneer mix came out so well that most of it was gobbled off before I could even think about it properly. Then I said I would need some for gyro and if they wanted, they can have the gyro as well. I was making for the vegetarians at home and this being a new dish, Konda had to taste and approve. She liked it very much and even skipped her chicken for this sake. Today’s combination is Vegetarian Gyros with Tzatziki, a Greek Specialty. 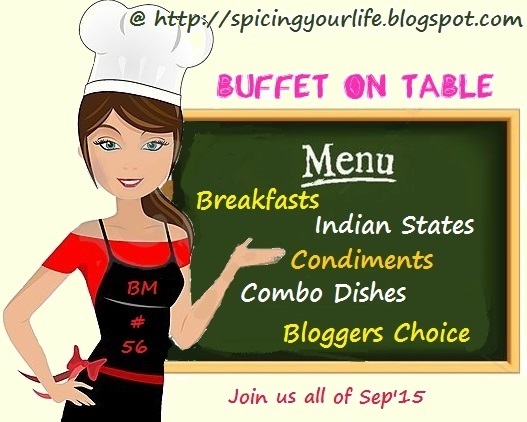 Its the Day 3 today under BM#56, Mega Marathon, Buffet On Table! The combination has been inspired by this and this. The pictures alone were drool-worthy enough to tempt me right away! Original recipe calls for Onion powder, I used minced onions and sauteed it and then added to the grilled vegetables. I used about 1 medium onion. Combine all the ingredients and blend them in a blender or spice grinder to a fine powder and store in an air tight container. Place the cottage cheese in a bowl, and sprinkle half a table spoon of the seasoning mix, crushed garlic, vinegar and olive oil. Mix well set aside for an hour. Cook the mixture over medium heat till a little dry. Remove from heat and set aside. Grill the cauliflower and capsicum over flame and when charred, keep it aside. Heat a pan with oil, saute minced onions and saute till browned. 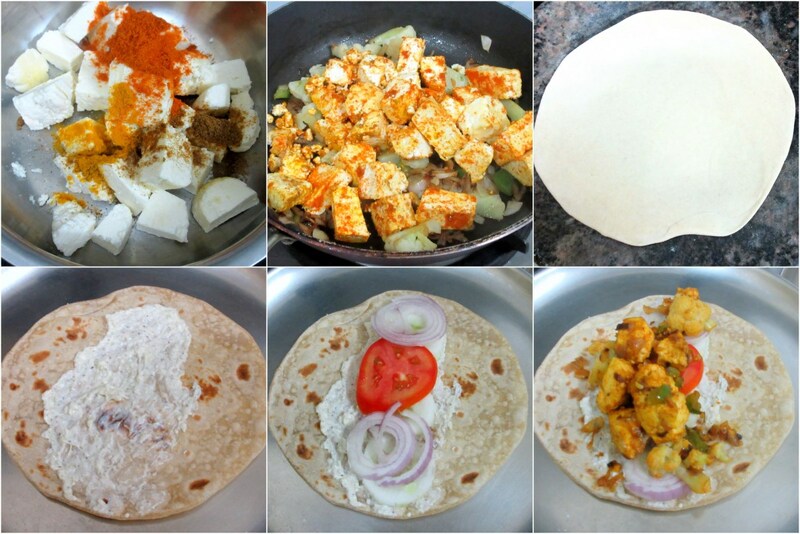 Then add the paneer and grilled vegetables, toss together. Heat the tortillas or rotis slightly on a hot tawa and place it on a plate. Place a lettuce leaf, if using, in the center of the tortillas and place 3-4 slices of cucumber on the lettuce. Next place some sliced onions, chopped tomatoes and sprinkle some salt and pepper. Spoon a table spoon of cottage cheese, vegetable mixture over the salad and top it with tzatziki. I even spread it first on the rotis before placing the onions. Roll up the tortilla into a cone and secure it with a tooth pick. Serve immediately with tzatziki on the side. You picked one of the most popular combo meal from Greece. The vegetarian version sounds so tempting.Nice combo. would love to relish this!! super awesome… i am so in love with your clicks..
Wow Valli instantly bookmarking ! Such food is always welcome in my family, it looks too good and is very very inviting. Absolutely fantastic! Bookmarking to try !! My family would love it too ???????? good job ! Tzatziki is my favorite dip that whole setup is making me drool..
That is a very interesting combo, Love your version. Sounds very flavorful. Had Gyros in Greece I sure this vegetarian one is yummy too. Love the stuffing went into the Gyros, have seen non veg version, but this vegetarian version sounds awesome..lovely combo again. This is a wonderful combination. I have tried it once and we just loved it. Gyros, again new to me..OMG, i'm gonna learn lot of new dishes from this Meg BM..Lovely presented and would try it near soon..
Vegetarian gyro sounds absolutely delicious Valli. Grilled veggies and paneer with the spices must have tasted amazing. Valli I had read about gyro but never made it. Lol was waiting for a readymade recipe. Bookmarking. this is one of most popular street food here although usually made with chicken and lamb. for vegetarians the falafels are usually available from same cart. Love your vegetarian take and it must be a hit if your daughter preferred it. The platter looks inviting. That is one filling meal valli. Looks perfect!! You have plated it so well, very inviting spread! 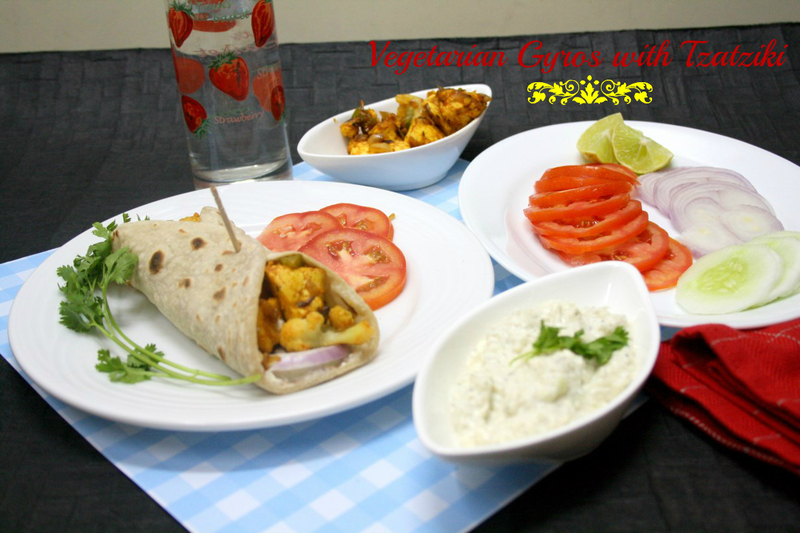 Veg version of gyros with paneer sounds very interesting dear 🙂 very interesting combo over all , I would love to dig in right away ! !